Today was a really good day. Last night was a little rough, though – I’m noticing it usually takes Amity a day or two to settle into a new place, which is hard when you’re moving every 3-4 nights. So, even though she had that super cool cubby, she woke up at 2:45 and demanded my presence for basically the rest of the night. Anyway, up and at ’em around 8:30. 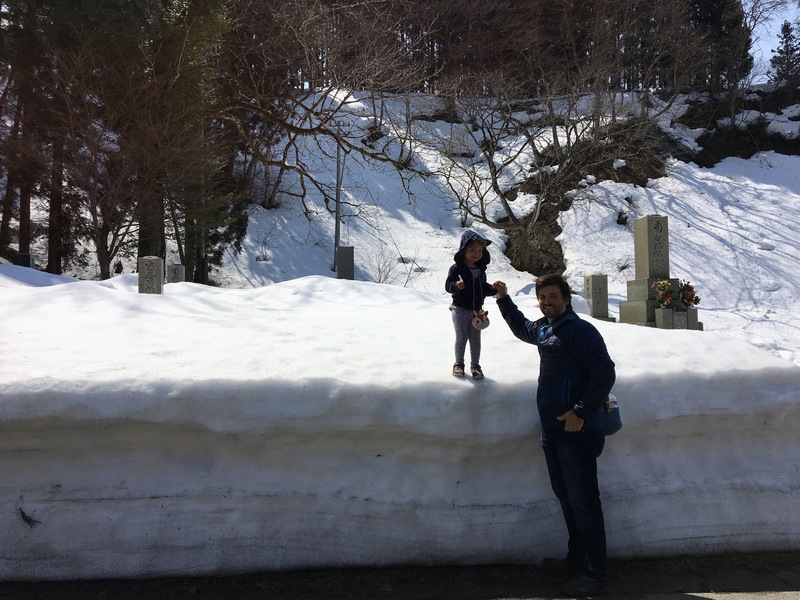 After getting ready, we walked the few blocks to the central bus depot to catch a bus to Shirakawa-go, a UNESCO world heritage site up in the mountains. 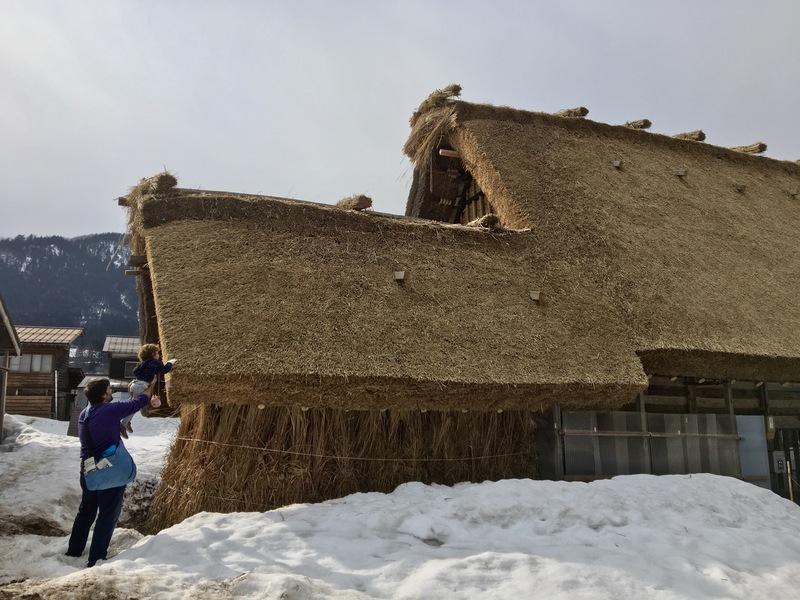 This village is famed for an old building technique called gassho-zukuri, which is a style with a very steep, thickly thatched roof. The bus is a quick 50 minutes, and along the way we somehow drove right into winter! 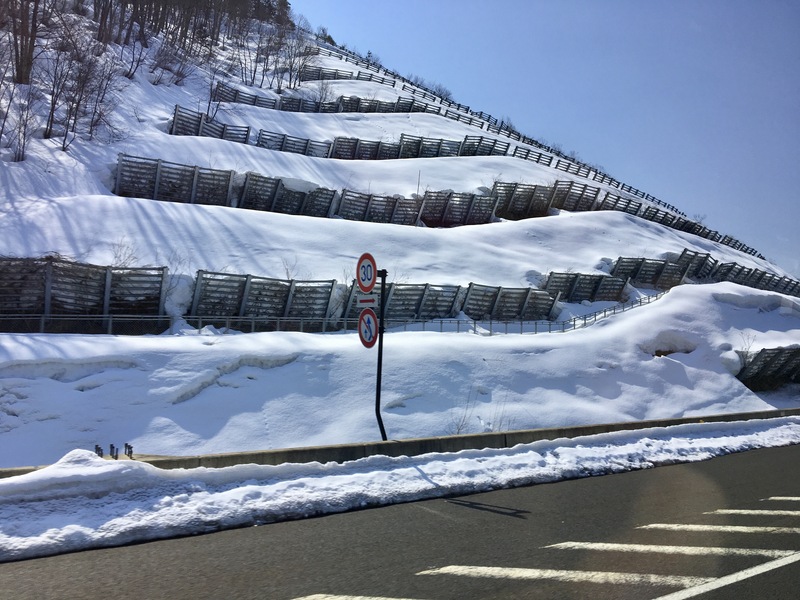 They clearly get a lot of snow in these parts – there is fencing along the highway to keep snowdrifts from sliding down the mountains. The ride on the Tōkai-Hokuriku Expressway was smooth and interesting. 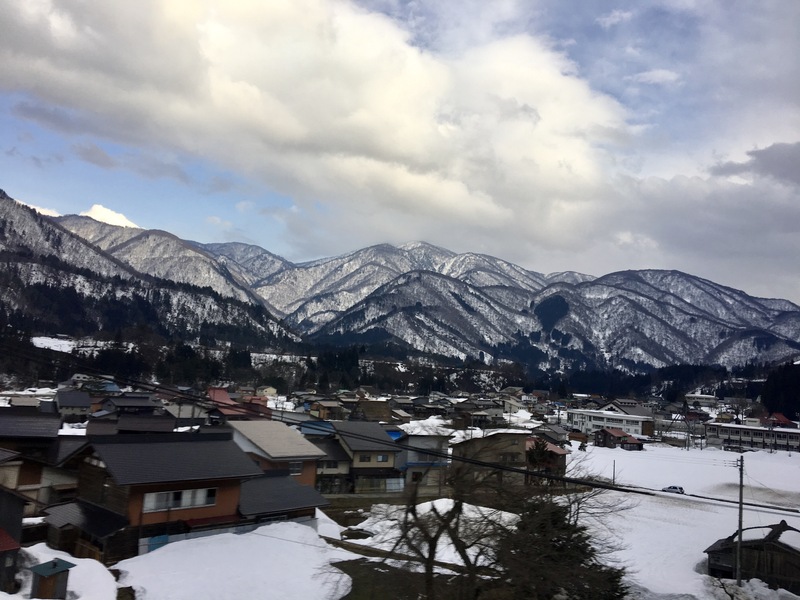 There were gorgeous views of snow-covered mountain valleys as well as some incredibly long tunnels. The Hida Tunnel, for instance, is over 6.5 miles long. What a feat of engineering! Ami liked the views for a bit and was sort of interested in the tunnels. 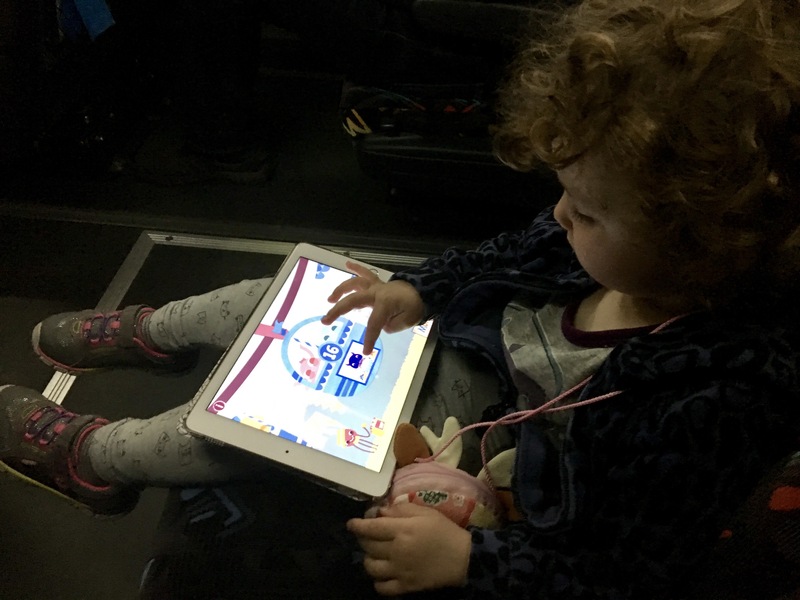 She loves a PBS Kids show called Dinosaur Train, on which the train often travels though a “time tunnel” to other periods, so several times she excitedly said “Mr. Conductor drive us through time tunnel!” Tunnels are only interesting for so long, though, so eventually she wanted the ipad for her number game. 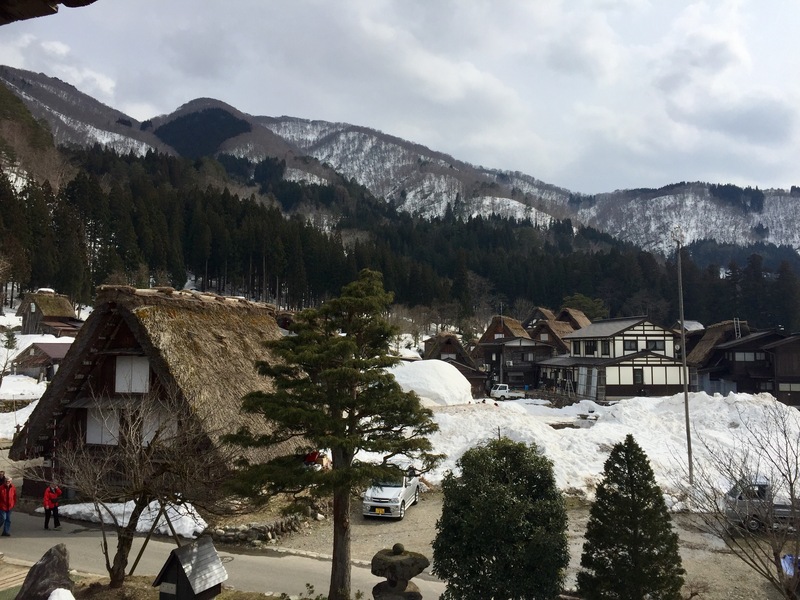 Arrival in Shirakawa-go went smoothly. We grabbed a tourist map and headed out to catch a shuttle to an overlook spot. 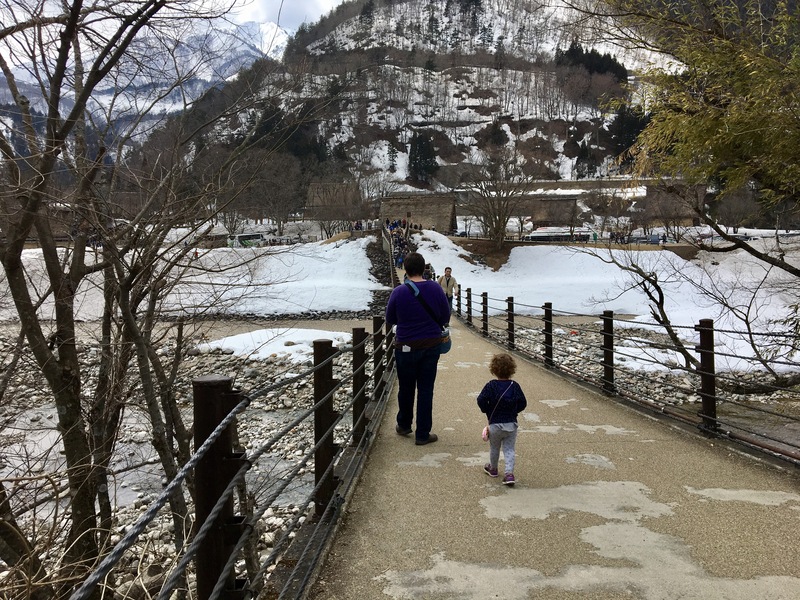 There are signs warning you that there are no trash cans in Shirakawa-go, which adds a wrinkle to your planning. 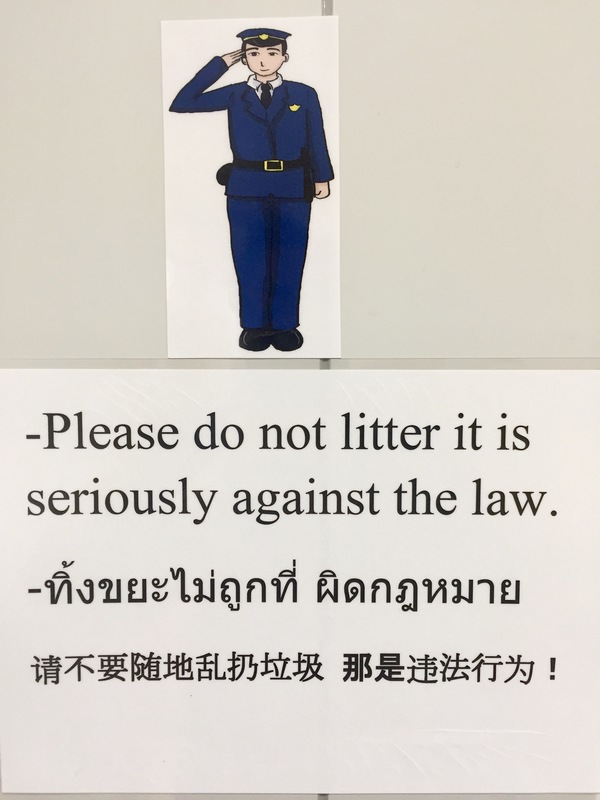 Yes, snack stands will have a trash can, but it’s usually pretty small and only for burnable trash (this is a designation Japan uses to differentiate from recyclables and from non-burnable non-recyclables, and it’s all very confusing and I still feel like I am throwing things away wrong). Later in the day, I got to carry around Ami’s diaper for a while because the public bathroom had no trash cans. Fun! 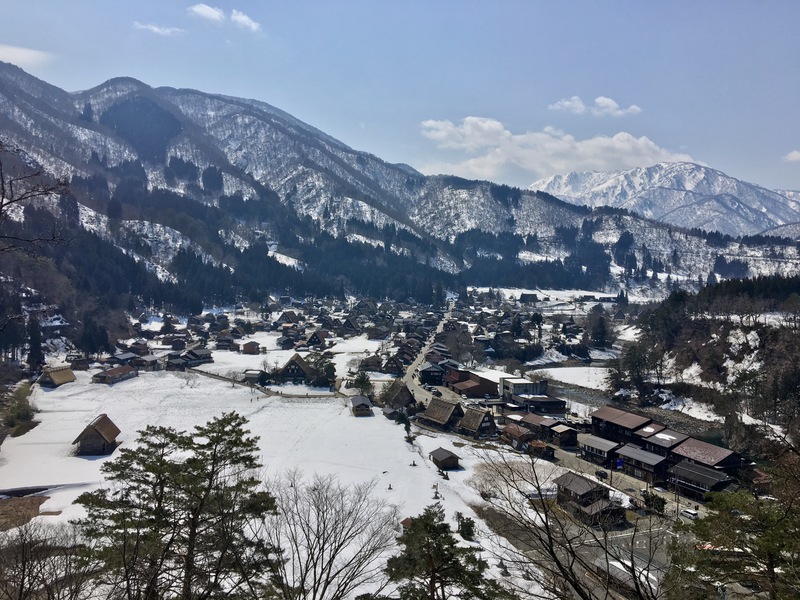 The overlook offered a very nice view of all the snow as well as Shirakawa-go’s thatched gassho-zukuri houses. Here is some more information on this building style, if you’re interested. It’s an ingenious adaptation of local materials to local weather. 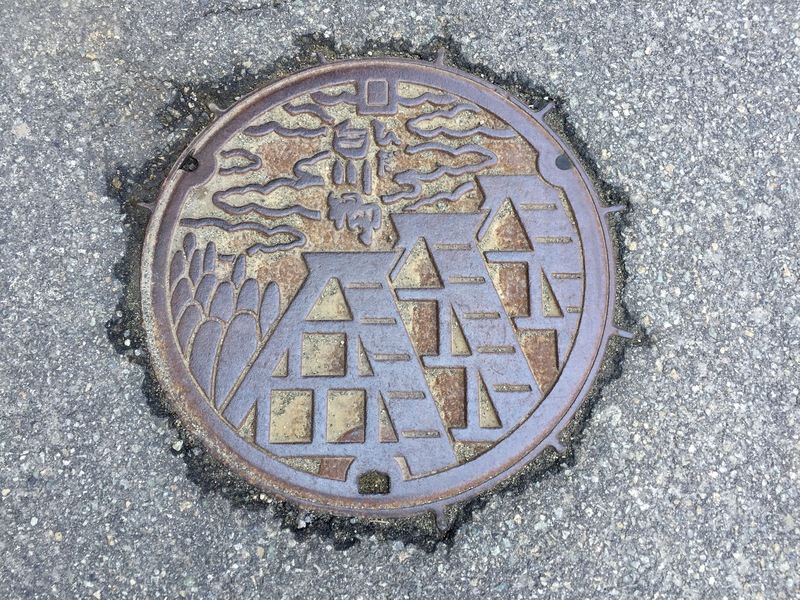 Even the town’s sewer covers are stamped with representations of the houses. The souvenir stands sell cookies and confections shaped like them, too! Though it looks frigid, the weather up there was actually gorgeous today. The snow is just so thick that it’s going to take a long time to melt! 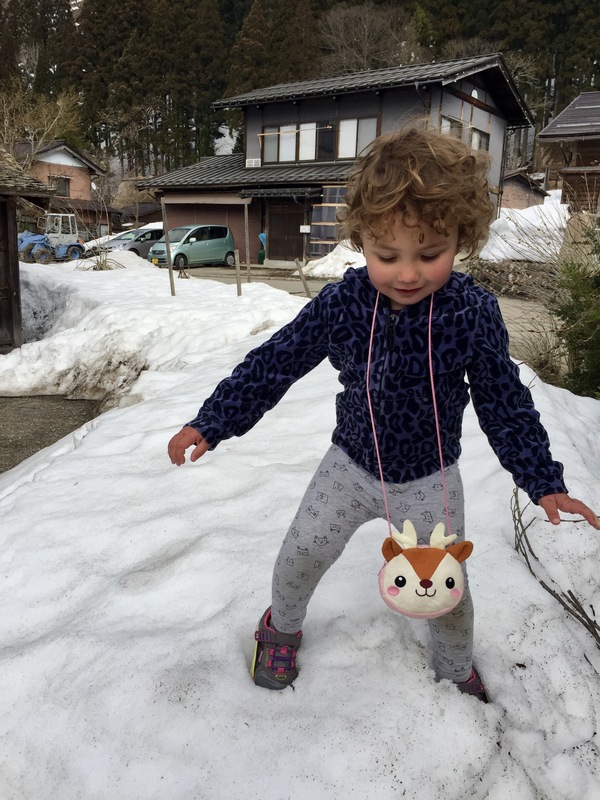 This was by far the most snow Ami has ever seen, and though it was that late in the season soiled state, she still really enjoyed it. A very kind shuttle bus driver agreed to drop us off at a restaurant partway back down the hill. I was excited to try this place! It had its own ponds for river fish! Also closed on Tuesdays. And now we were fresh out of ideas and I was getting pretty hangry and frustrated. Checked three more places. All closed on Tuesdays. 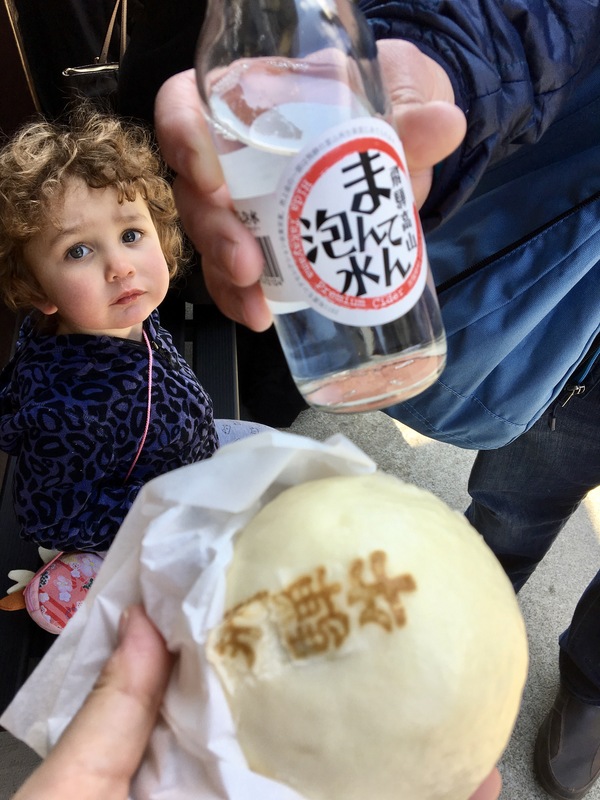 Eventually, we found a snack window where a very nice woman sold us a steamed bun filled with the region’s famous beef, Hida beef, and a locally bottled apple soda. Oh man, that helped. Shoulda eaten some breakfast. Thankfully, soon after I demolished 90 percent of this bun, leaving a grudging bite for Logan, we found a couple of places that were open. YAY! 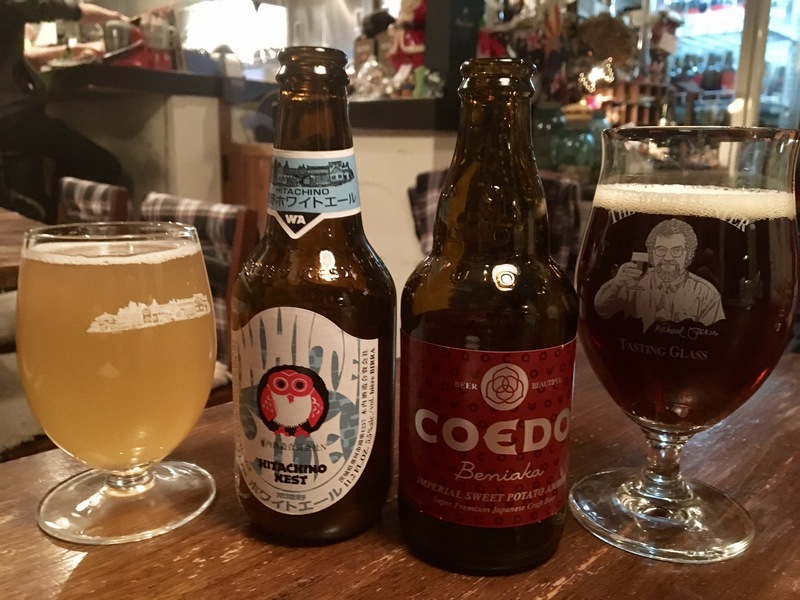 We chose one that offered hoba miso and… hornet larvae? The hornet larva was, as Ami would say, not my fado (favorite). They were a little crunchy and kind of sweet, but had an odd slightly bitter aftertaste I couldn’t get past. 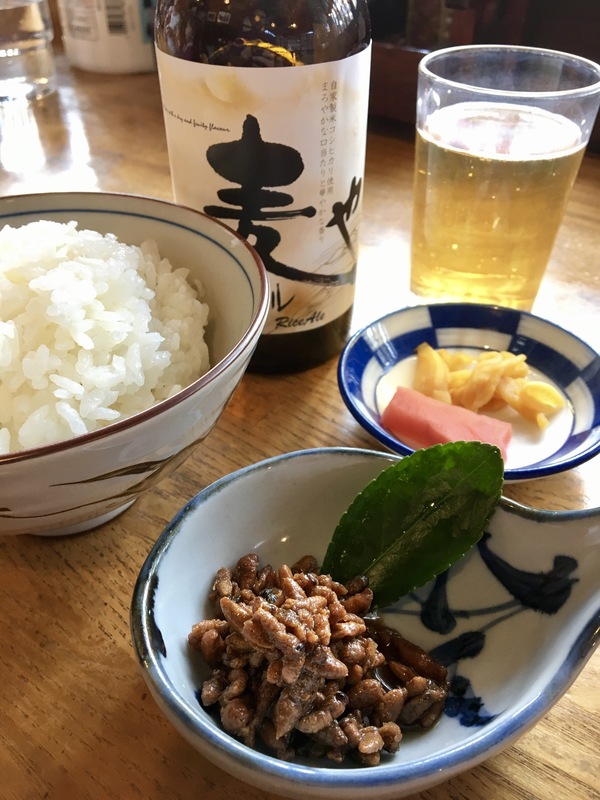 For our meal, we both ordered set lunches with hoba miso (that’s the miso cooked on a magnolia leaf), soba noodles, local pickles, miso soup, rice, and some of the mountain vegetables. 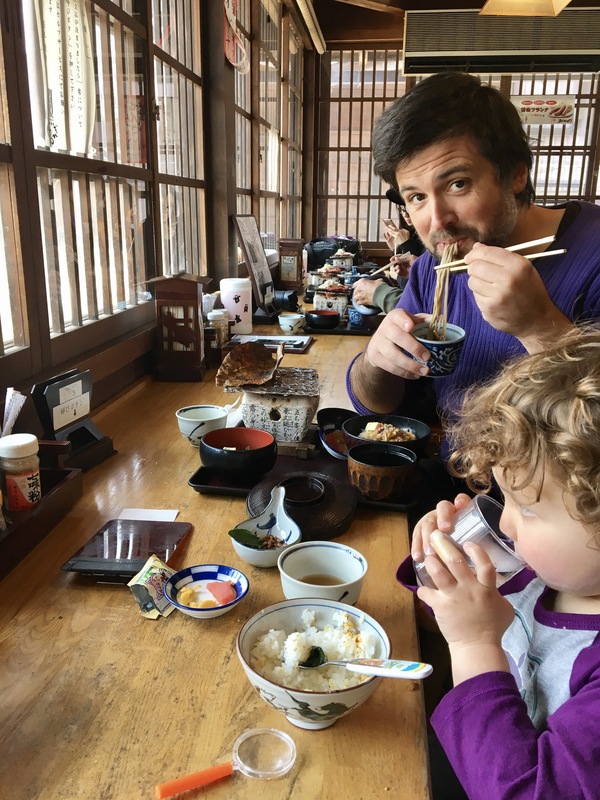 I had my hoba miso with just tofu, mushrooms, and leeks, while Logan’s had all of those and some of the Hida beef. 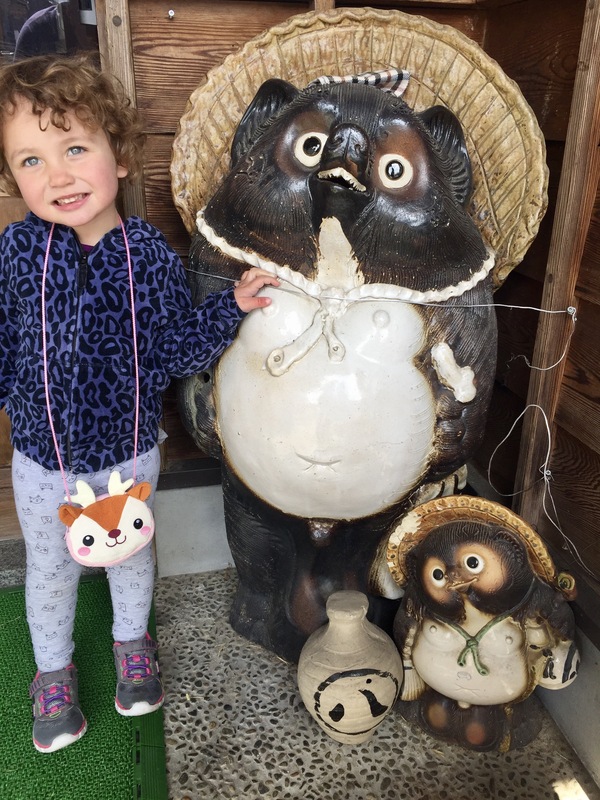 Ami liked her white rice with sprinkles (furikake packets we picked up at a supermarket a while back). She ate a bit of Logan’s beef and some of my greens. 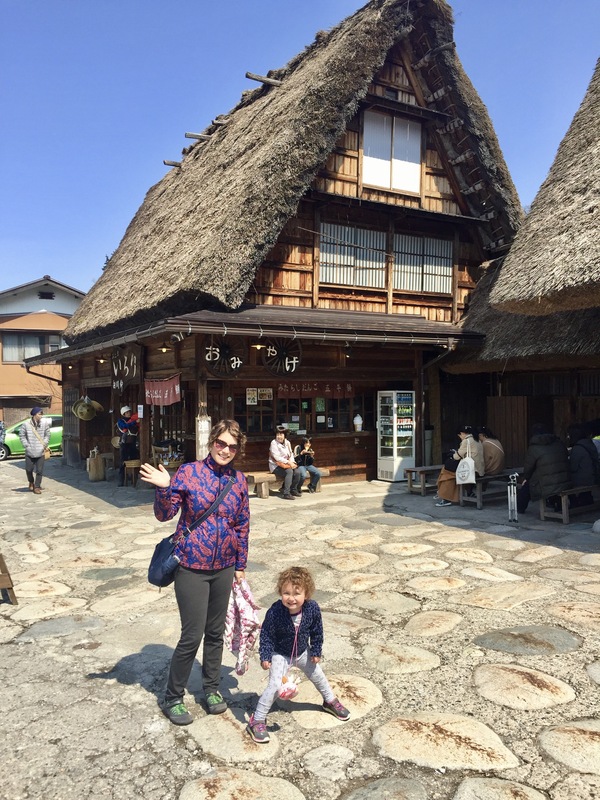 After lunch, we were off to explore the shops and sights of Shirakawa-go! There’s a concrete (!?) suspension bridge over a riverbed between the two parts of the village, so we headed that way to check it out. Suspension bridge. Concrete. It’s a little bouncy for my taste, and I tried not to think too hard about what was keeping it up as we sprung across it. That picture doesn’t really show the scale. It’s kind of hard to see. You wouldn’t want to be on it when the concrete fails, is all. On the other side of the bridge we found a shop selling soft serve ice cream. 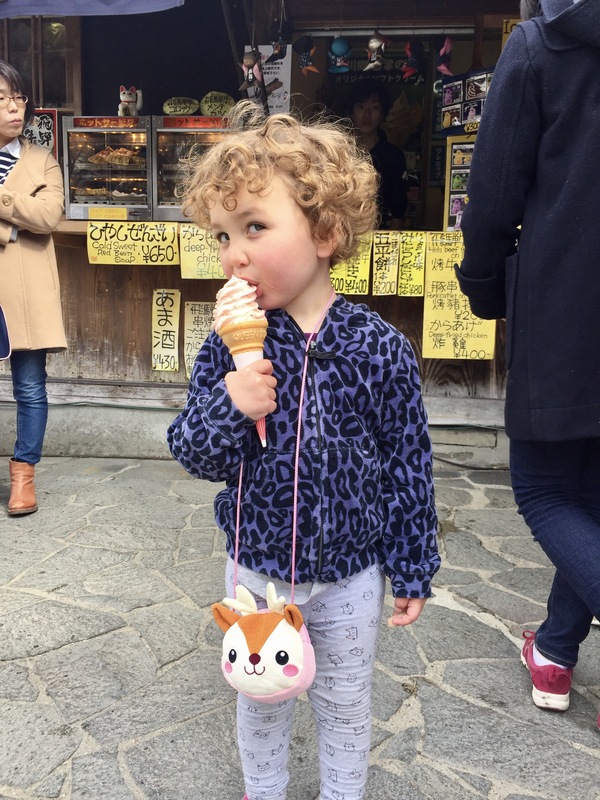 Logan and Ami both got cherry-blossom flavored cones. Ice cream achieved, we walked back through the town towards a couple of the houses that are open to the public. On the way, we saw some fish ponds where residents keep trout! 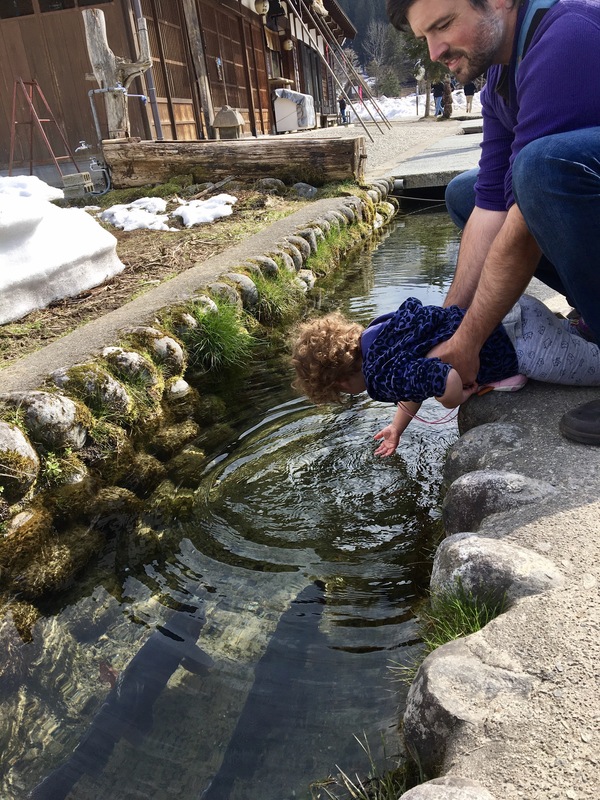 They’ve dammed the gutters that carry the snow runoff to create pools where the water moves a bit more slowly. How neat! We ended up looking at two houses, the Wada house and the Kanda house. Both were heated with huge iron kettles set on a fire pit in the middle of the floor, so they were both pretty smoky inside. They were made almost entirely of dark wood, with HUGE beams made from the curved trunks of trees that were deformed by the weight of the snow! 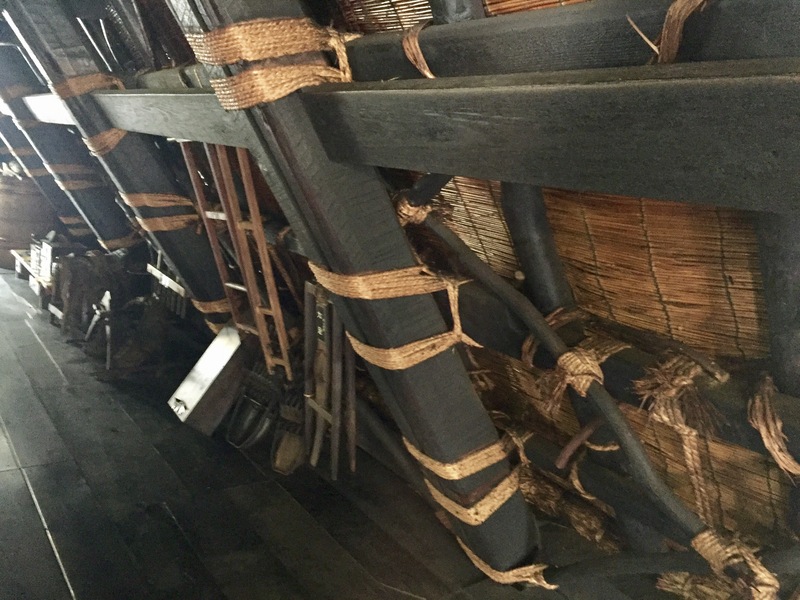 These beams were lashed together with rope, which makes for a structure that can bend and sway under pressure. Good both for the huge amounts of snow they get in this area, as well as earthquakes. 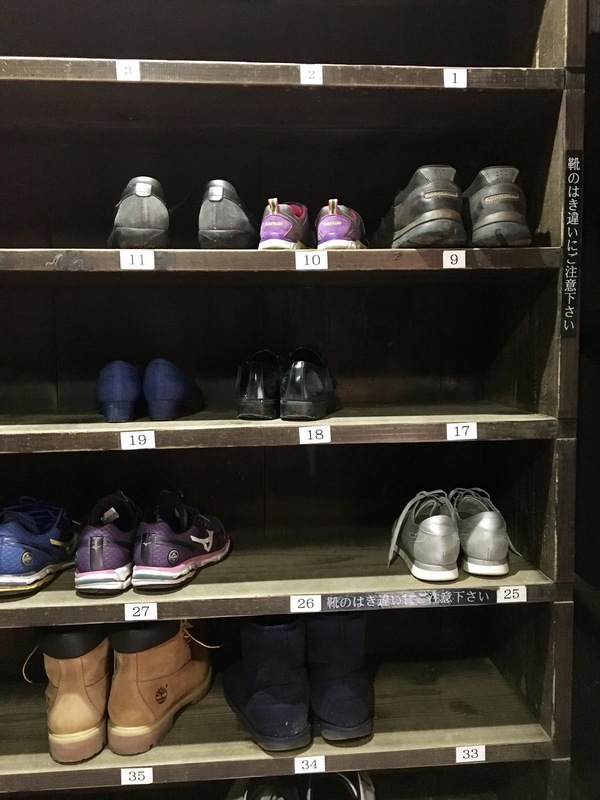 Of course, you take your shoes off to tour the houses. And the views from the top floors of the houses are very nice, if you don’t mind teetering up steep ladders! 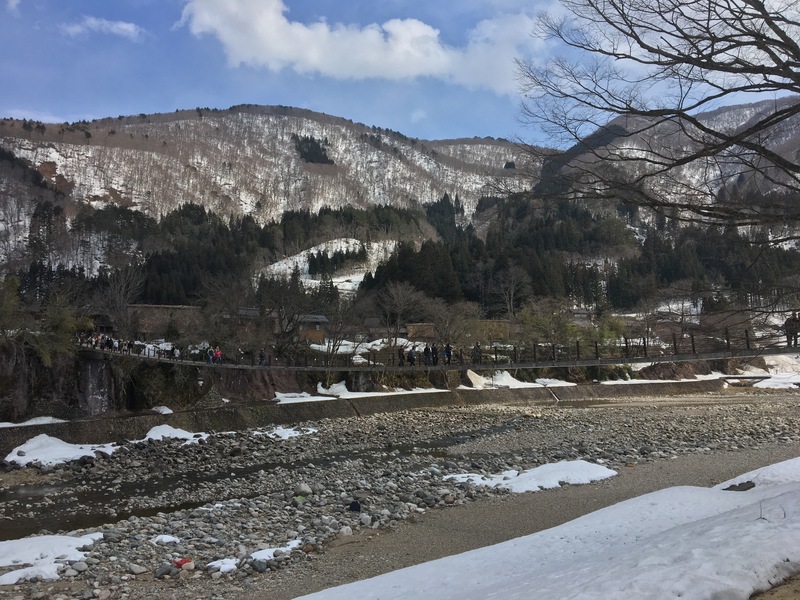 Soon, it was time to start poking our way back towards the bus station to get back to Takayama. First, there was more snow to be played with, of course. 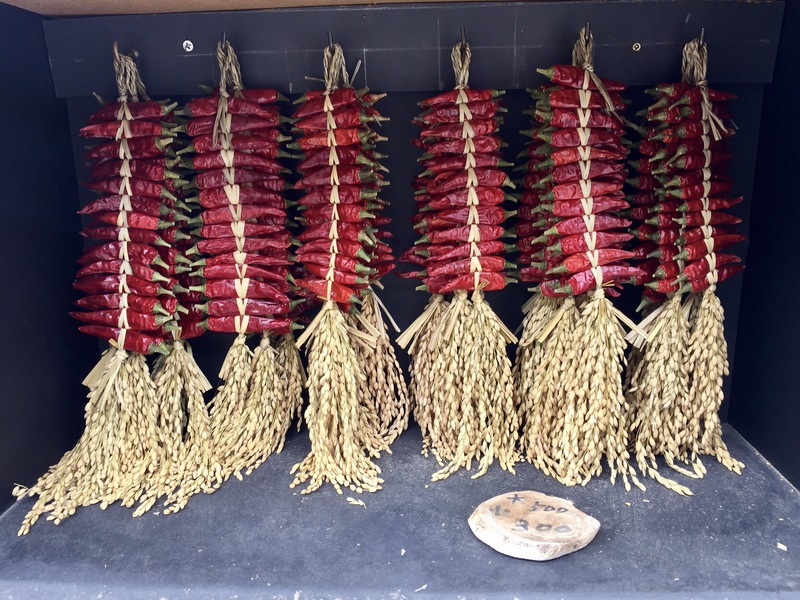 And Japanese-style chile ristras to admire. We actually stumbled upon a house with a roof in the process of re-thatching! This has to be done every 20 to 30 years. 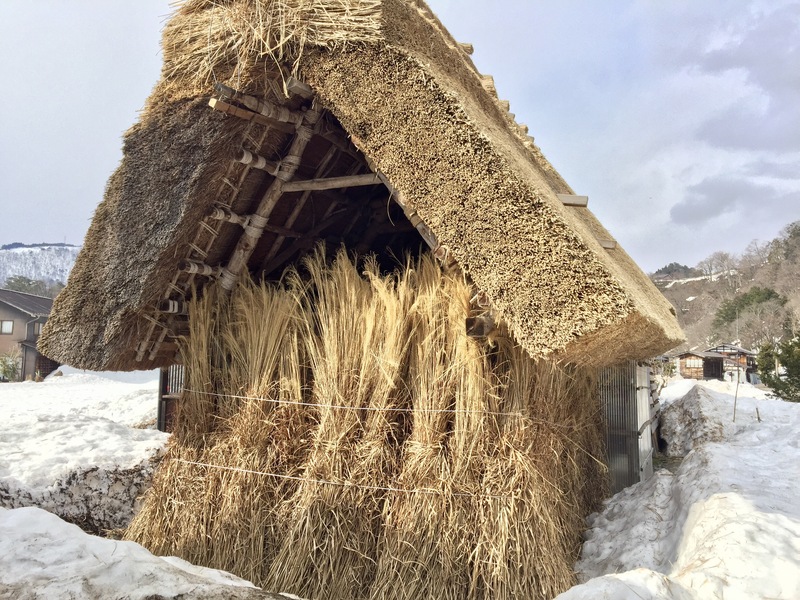 The snow was piled high enough around the house that you could touch the thatch. The bus back was, again, really nice and comfortable. 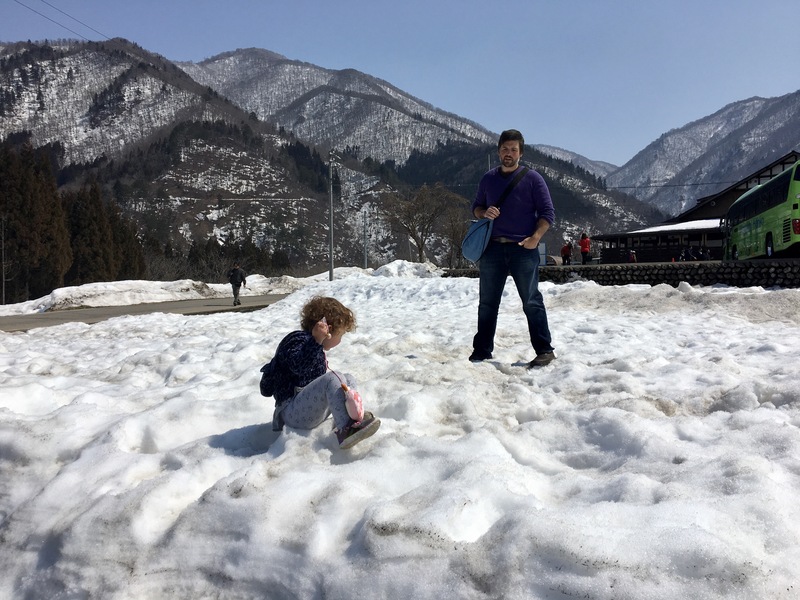 Ami’s train and bus tickets in Japan have all been free, which is great for the budget, but the expectation is that she will sit on our lap if things get crowded. She had her own seat today coming and going, which was a relief for all of us! 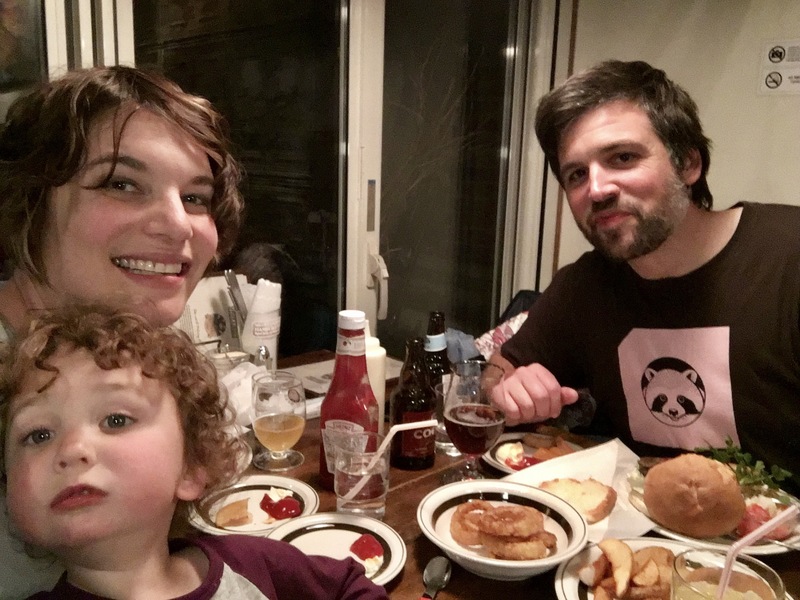 Dinner tonight in Takayama was at Center4 Hamburgers, a restaurant serving… guess. No, I’ll wait. They also have beer! Logan ordered an amber made from sweet potatoes. I figured it was time to offer Ami something a little more familiar, and boy was she happy to see a hamburger and French fries. 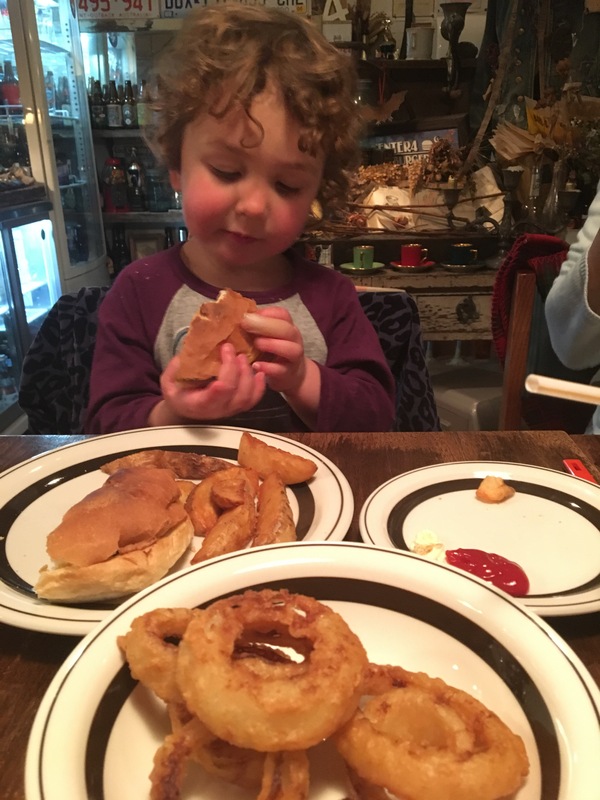 They also had really, really good onion rings. They also offer a burger made from the special Hida beef. It’s about 4 times the cost of a regular burger, or 2600 yen ($23.50). It was fun to try, but I don’t think it was 4 times as good as their regular burger. And that was today! 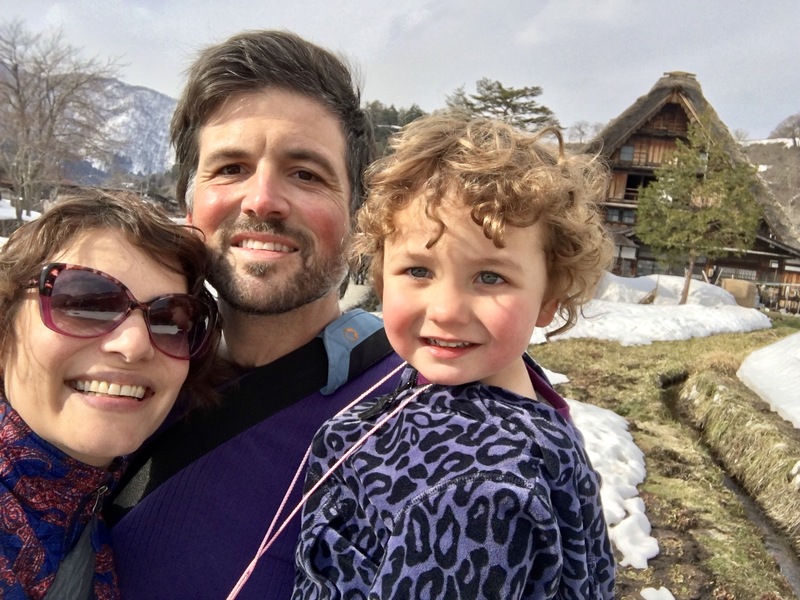 Tomorrow, we will stick around Takayama, I think. We still have souvenirs and gifts to buy!